Gary is dedicated to passing on his knowledge and teaches workshops around the United States. Future offerings are described here as well as a recap of some recent events. A hallmark of Gary's approach to teaching is that he makes it a lot of fun to learn. Classes are dialog-rich and content is driven by the participants as much as by the instructor. Gary's teaching experience dates back to his college days. Thankfully he doesn't have to give tests or grade exams but he does like to challenge his students to get everything possible out of his classes. Gary is a supportive teacher and coaxes his students to exceed their own expectations, however he does this from the positive side with carrots, not sticks. If you read the comments below you will see that his methods make for fulfilled students who want to come back again and again. Grand Teton National Park, Wyoming in July, 2018. Three Day Workshop, El Dorado, Arkansas, November 9-11, 2017. Gary will again be painting in Grand Teton National Park in this paintout event sponsored by Rocky Mountain Plein Air Painters for the benefit of Grand Teton Association. If you visit the park in early July you will find many famous artists working in the park. Check with the Grand Teton Association or Rocky Mountain Plein Air Painters to learn about next year's event. Gary will participate in a group paintout in Jackson Square one day and the quick draw painting event on Saturday morning. Gary will teach a landscape pastel workshop in the picturesque city of El Dorado, Arkansas. As the only workshop Gary is holding in 2017 outside of Wyoming, it's an opportunity not to be missed. The number of students will be limited to provide the best learning experience for everyone who attends. Due to the need for economical plane tickets, the class will be cancelled if not enough sign up early so make your plans to attend now! El Dorado is a vibrant community and November should be neither too hot nor cold. For detailed info and Gary's workshop description, click this link. 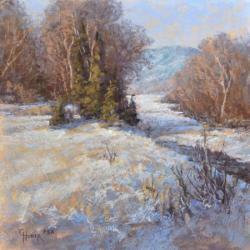 "I have so enjoyed your pastel workshop...in Dubois, Wy. Your presentation and instruction was excellent. Among the things I found most helpful was using a lighter touch in applying the colors, preparation of supports, learning how to frame without mats, and the introduction to Terry Ludwig pastels. Thank you, Mr. Huber. Sincerely, Doris Snyder, Artist." "Thanks again for a really informed workshop. I do want to learn your process then see what I might do. Sincerely, Lee Modesitt." 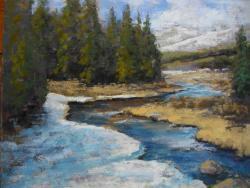 Wyoming Artists' Association two day workshop, May 7 and 8. Gary taught for two days as one of the instructors at the Wyoming Artists' Association's annual meeting and art show, May 7 and 8. The event was held at the Headwaters Conference Center. He had truly a standing-room-only crowd of 24 students. His demo painting was sold at the event to a workshop participant. 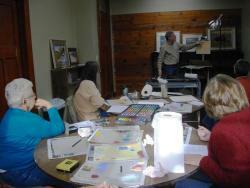 Many attendees asked about having Gary teach a plein air workshop and one is now in the planning stages. Casper Artists' Guild two day workshop, April 1 and 2, 2016. 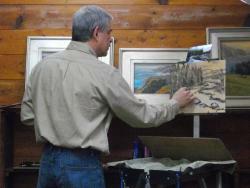 Gary held a full two day workshop on the 1st and 2nd of April at the Art 321 center in Casper, Wyoming. The workshop was sponsored by Casper Artists' Guild but open to the public for a very reasonable fee. The workshop was very well attended with about 12 participants from as far away as Montana. 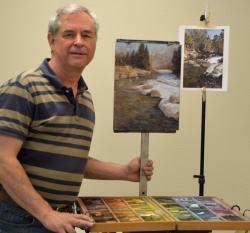 Gary held a hands-on half-day pastel and landscape painting workshop on May 1, 2015 at the Showcase Art Center. Contact Colette Pitcher at (970) 356-8593 if you're interested in her scheduling another workshop there. He covered landscape composition, atmospheric perspective and creating mood in paintings. Also info about the basic materials and techniques used in pastel painting was given: something for every level of painter or even art collectors wanting to learn more about pastel. Winter Impression (left) was painted from memory as a class demo. As part of The Brinton Museum's new "Meet the Artist" program, Gary gave a well-attended pastel painting demo on Sunday, November 15 followed by two hours of socializing and mingling. There were enthusiastic comments from the attendees and the museum staff. The demo was held in conjunction with a 32 piece exhibition of his pastel work which can be seen on the walls of the room. Gary painted and gave painting demonstrations at the Mendocino Open Paint Out. This was a wonderful opportunity to interact with Gary and other well-known artists as they painted around the picturesque town and coastline of northern California. Gary was featured as a "Celebrity Artist" for the event which ran from September 8-13, 2014. You can find out about the event for the current year and register for all the fun activities at Mendocino Plein Air. At the Waterworks Art museum in Miles City, Montana, out on the plains, a spectacular art show was held in October, 2014. Gary had his work exhibited along with western art luminaries Bob Barlow, Lorenzo Chavez, Aaron Schuerr, and sculptor, Mike Barlow. Gary gave gallery walk discussion of his work in the show and had a pastel painting in progress to show visitors his method. The workshop in Dubois, Wyoming was sponsored by the Wind River Valley Artists' Guild. WRVAG is a very old and well-respected organization in Wyoming. In fact my workshop was held in conjunction with their 65th Annual National Exhibition. This was the registration form: WRVAG workshop flier. The dates were July 18-20, 2014. I tried to make the class relevant to artists of all abilities although that was a big challenge. I demoed in pastel but anyone wanting to improve their landscape painting skills was welcome in the class. The real focus was on adding drama to landscape work because that is something I've focused on in my own work. The medium is of secondary importance to my way of thinking. You can get great effects in any medium if you know what you're aiming for. When it comes to specific paint-handling skills, I can only teach pastel with any authority. 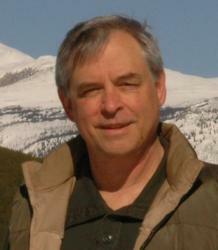 In November 2013, Gary taught a two-day workshop in Buffalo, Wyoming. He stressed pastel landscape painting for artists who had experience in other mediums but wished to learn more about painting in pastel. The six participants were enthusiastic and open to learning and having fun. Only one had any previous experience with pastel but all had extensive art experience, mostly working in oil. Gary says, "We had a blast! I've never been so inspired by a group of painters wanting to try new things. At times we almost laughed ourselves hoarse but in the end every student turned out one or two paintings worthy of entering in shows. I was extremely proud and honored for them to have entrusted me with their pastel education." "Watching you work is like magic. I would highly recommend your class." 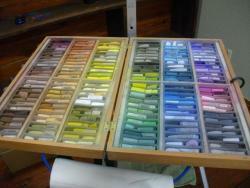 "Gary is very knowledgeable and able to teach - not just show how to work with pastels! I so enjoyed learning and trying." "Great info - from basic composition refresher - new terms to (me) at times - technique and presentation - great! :) Don't miss it! I would take it again if offered." "A good review of basics. It was fun to use the different materials. I had no idea there was so much difference. Your paintings are amazing! I would never guess they were pastels without knowing." "I learned things that I can directly apply to my oil painting & I appreciate pastels even more now. This was awesome! I especially appreciated your sharing the materials with us. Anyone can learn new things even if you are not a pastel painter." Gary says, "It was a real pleasure to share our art experiences and to help fully-realized artists experience pastel painting. Several students have contacted me and told me they have kept working with pastel and have acquired pastel sets and surfaces to keep up with their learning. I'm gratified to hear those comments! Thanks!! !